He had grown tired of waiting for constantly thwarted opportunities to grab doggie delicacies from the open refrigerator. Vigilant humans, experienced in dog wiles, made success nearly impossible. It was tomato season - a bumper crop. Arthur loves cherry tomatoes above all things. His cunning raids on the garden are legendary. A fence is a minor obstacle to a truly clever dog in search of tomatoes. Still, Arthur felt there was an easier way. Huge bowls of cherry tomatoes swept past him and entered the refrigerator. He knew what he had to do. With the humans safely in another room, Arthur worked out the problem. Brace your shoulder against the cabinet and use your nose like a pry bar to open the refrigerator door. Front paws add leverage. You're in. For years afterward, nothing was safe. Half a Christmas cheesecake, pounds of tomatoes, loaves of bread. A few unguarded moments were all he needed to breach paradise. The other dogs were beneficiaries of his skill. Arthur had very specific desires. Anything in the way of the prize was flung over his shoulder to the waiting masses. Carnage prevailed. For years, Arthur worked the door until; A.) success or B.) the scratching sounds were heard by the humans and the mission was aborted. By the time a sentry arrived to check on the noises, he was innocently lapping water from his bowl. This strategy was so successful that for months the problem was blamed on a faulty refrigerator door or careless humans. Then his hearing started to go and with it went his opportunity to savor the "Food of the Gods" direct from the source. Success depended on stealth. Stealth depended on hearing. The whole scheme unraveled. Paradise was lost. You never know what a dog will relish. With Arthur it's tomatoes and grapes. Earnest would kill you for your spaghetti. Tristan liked beverages and drank the coffee, tea, cola, or hot chocolate of unsuspecting guests who came from households where you could do something as silly as leave food unattended for a moment. Emma's current passion is bananas. There are however, items which, in our pack, have universal appeal. Peanut butter, ice cubes and chocolate seem to be magical. The ice cubes we feed freely - so freely visitors have accused us of being too cheap to buy dog biscuits. You can break your neck sliding on the uneaten bits, but the dogs enjoy them so the risk is acceptable (plus, if you don't offer them willingly, they will just take them out of your glass when you're not looking). Peanut butter is sparingly received on the uneaten crusts of PBJ sandwiches. Warning!~peanut butter on your breath can get you in trouble. Dogs are sure you will refund the sandwich if they stare long enough. If you do not, they may attempt to enter your face to retrieve it themselves. Chocolate, however, is handled with only slightly less care than our government uses to store toxic waste. Actually we're a little better at containment - we've never had a spill. Any female past puberty can tell you chocolate is not a food - it's a drug. While this recreational drug is both soothing and exciting to humans, it can be fatal to dogs. That assorted box of chocolates you got for Valentine's Day can kill a small dog. Even small amounts can cause nasty gastric complaints. Check with your vet if you don't believe me. This is not just an attempt to keep it all for myself. Despite their cravings, my dogs are kibble kids. 99% of their diet is high quality dog food designed for balanced nutrition. They may be bored, but they're safe and well nourished. I listen to the vet's advice on the health benefits of a sensible diet and maintaining a proper weight even though I ignore my doctor's advice on that subject. I must make good choices for them. 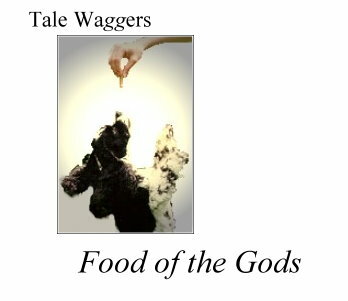 ...but, every now and then, they even manage to get their paws on the "Food of the Gods".